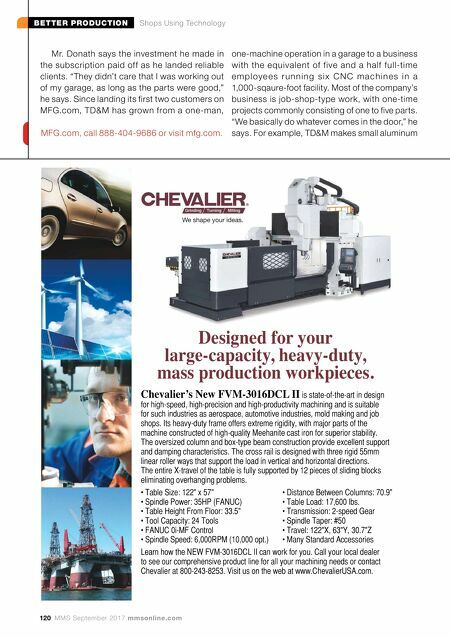 BETTER PRODUCTION Shops Using Technology 120 MMS September 2017 mmsonline.com Designed for your large-capacity, heavy-duty, mass pr Chevalier' II is state-of-the-art in design for high-speed, high-precision and high-productivity machining and is suitable for such industries as aerospace, automotive industries, mold making and job shops. Its heavy-duty frame offers extreme rigidity, with major parts of the machine constructed of high-quality Meehanite cast iron for superior stability. The oversized column and box-type beam construction provide excellent support and damping characteristics. The cross rail is designed with three rigid 55mm linear roller ways that support the load in vertical and horizontal directions. The entire X-travel of the table is fully supported by 12 pieces of sliding blocks eliminating overhanging problems. • Table Size: 122" x 57" • Distance Between Columns: 70.9" • Spindle Power: 35HP (FANUC) • Table Load: 17,600 lbs. • Table Height From Floor: 33.5" • Transmission: 2-speed Gear • Tool Capacity: 24 Tools • Spindle Taper: #50 • FANUC 0i-MF Control • Travel: 122"X, 63"Y, 30.7"Z • Spindle Speed: 6,000RPM (10,000 opt.) • Many Standard Accessories Learn how the NEW FVM-3016DCL II can work for you. Call your local dealer to see our comprehensive product line for all your machining needs or contact Chevalier at 800-243-8253. Visit us on the web at www.ChevalierUSA.com. Mr. Donath says the investment he made in the subscription paid off as he landed reliable clients. "They didn't care that I was working out of my garage, as long as the parts were good," he says. 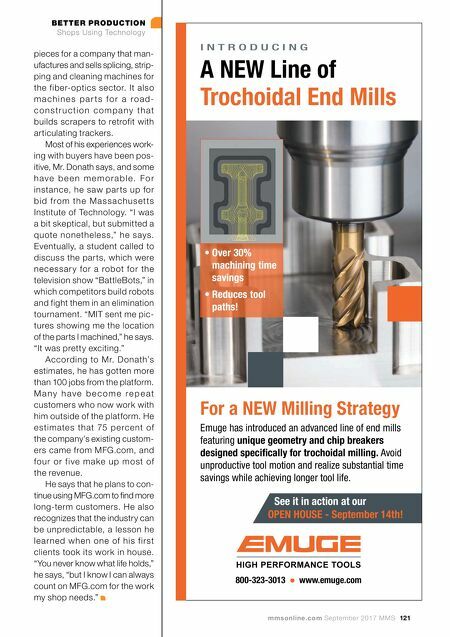 Since landing its first two customers on MFG.com, TD&M has grown from a one-man, one-machine operation in a garage to a business with the equivalent of five and a half full-time e m p l oy e e s r u n n i n g s i x C N C m a c h i n e s i n a 1,000-sqaure-foot facility. Most of the company's business is job-shop-type work, with one-time projects commonly consisting of one to five parts. "We basically do whatever comes in the door," he says. For example, TD&M makes small aluminum MFG.com, call 888-404-9686 or visit mfg.com.